Lilya Kas'yanova, one of Kyrgyzstan's finest guides, is passionate about the history, art and craft of her country. 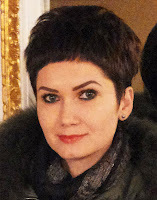 A graduate in Linguistics and Intercultural Communications from I. Arabaev Kyrgyz State University, she is also a keen photographer and hiker. One of the joys of travelling with Lilya is listening to her vast knowledge of Kyrgyz folk tales. Earlier she wrote of the Edelweiss and the Legend of the Broken Heart. In this piece she writes about the tragic tale of the 11th century Burana Tower, jewel of the Karakhanid empire. Once upon a time, a power-hungry khan decided to occupy the settlement of Tokmok. He left his beautiful daughter and her glittering retinue in a nearby mountain gorge. Then, together with his formidable army, he headed for the Tokmok stronghold and took it by storm. The khan perpetrated an incredible massacre. He commanded his men to slaughter all the townspeople. No one was spared - neither women and their children nor the old folk. Only one old woman managed to survive the calamity. Soon thereafter the old lady came to see the khan. Finally, she was granted an audience with the unfeeling villain. The woman pulled herself up to address the khan, and exclaimed acrimoniously: "Being insensible to pity, you killed my sons and exterminated all peace-loving people. Mark my words! Your only child, your adorable daughter, will die on her coming of age!" 2. to build a tower, where his lovely daughter could be sheltered from imminent peril. As soon as the construction of the impregnable tower was completed, his daughter was secluded there. No one was allowed to visit her except the handmaiden who brought her food. Despite all these precautions taken against the blistering condemnation, the maid’s coming of age day was indeed the last day of her life. To celebrate her birthday, the khan’s daughter was given a platter of tasty, fleshy fruits. 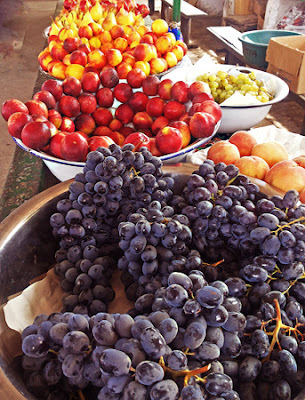 When she touched a bunch of grapes with the tips of her fingers, a steppe spider emerged and bit her. She uttered a cry and died. The empty tower survives to this day and still commemorates the mournful event that took place in those far away days. 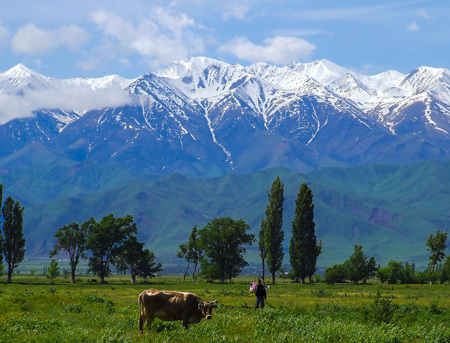 A visit to Burana Tower, about 70 kms east of Bishkek, is included in an Uzbek Journeys tour. 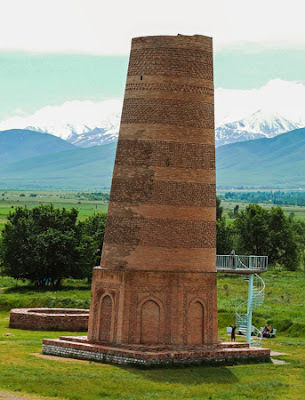 As well as Central Asia's oldest minaret the area includes an open-air museum of balbals – grave statues – moved here from different regions of Kyrgyzstan.